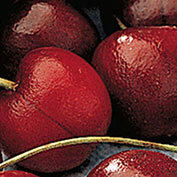 North Star Pie Cherry Tree | Gurney's Seed & Nursery Co.
Natural dwarf grows just 10 ft. tall. Mouthwatering fruit ripens mid to late July. Dependably hardy, with huge harvests for pies and preserves. Excellent resistance to brown rot and leaf spot. Produces annually. Self-pollinating. Why buy a Deluxe package - Deluxe fruit trees include 2 oz. Quik-Cal Pelletized Calcium to enhance fruit quality, 12 oz. bag of Fruit Tree Food Starter Formula, easy-to-use tree ties, a premium tree guard to protect the trunk from gnawing pests, mowers and weed trimmers, and a copy of Backyard Horticulture for Fun and Profit--How to Make $10,000 in Your Spare Time. NOTE: We are unable to ship our trees to PO Boxes at this time. 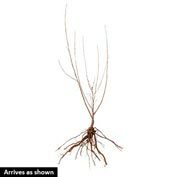 Depth: Plant with graft union 2 inches above the soil surface. Yield: Approximately 1/2 - 1 bushel at maturity. Foliage: Dark, shiny green foliage. Fruit: Large fruit with thin, light red skin, red flesh, and red juice. Soil Requirements: Well-drained, sandy, organic loam soil. Growth Rate: Medium growth rate. Comments: Pie cherry. Holds flavor during processing. Small, free pit. Extra-hardy, reliable and attractive. 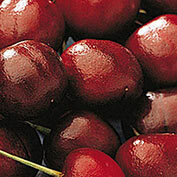 Fruit will retain quality on the tree up to 2 weeks after ripening. Fruit is crack resistant. Vigorous tree which bears heavy crops often in the second year. 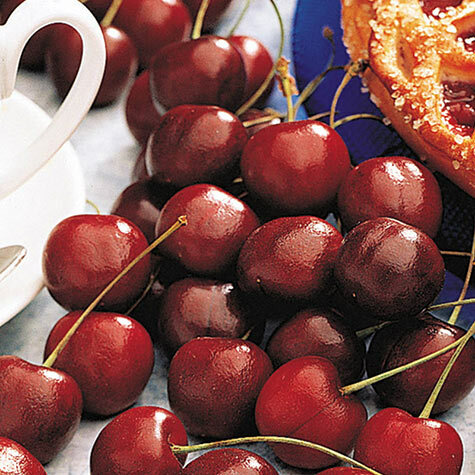 CHERRIES DO NOT LIKE WET FEET. DO NOT SOAK TREES FOR OVER 24 HOURS, PRIOR TO PLANTING. IF FERTILIZING WHEN PLANTING, ONLY USE A SLOW RELEASE FERTILIZER.